Newborn Toy Story Photo Shoot Christy Whitehead - Newborn Photography | Schedule Your Newborn Shoot Today! This sweet girl's photo appears on the wall of my studio. A similar image from this session was featured on Buzz feed for Geeky and Nerdy newborns. Occasionally one of my images from this set pops up somewhere on the web or Pinterest for the same reason. 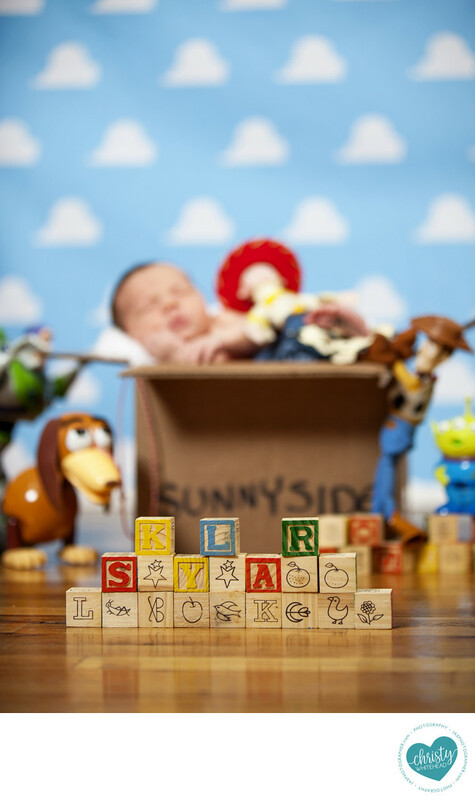 When I went to do this session, I scoured the web and Pinterest and couldn't find any Newborn sessions with a Toy Story theme. I'm a huge Pixar and Tom Hanks fan and I started brain storming. I needed a container for the baby to lay in so I started watching the movies. When I saw Andy packing the toys in boxes, it hit me! I designed the cloud backdrop in Photoshop and had it printed out on a background. It's so odd to search Pinterest now, there's a TON of Toy Story sets and the majority of them are modeled after my original set.